Victory – House Votes to De-Fund V.A. Dog Labs! Tere — thanks to you, the House just voted to completely defund the Dept. of Veterans Affairs’ painful dog experiments! Now we’re ready to take this fight to the Senate. Here’s the deal: The Senate may leave for recess in less than two weeks. And we MUST fund more ads and rally 100,000 more taxpayers while there’s momentum to de-fund. Tere, my strategy team believes another win will create the momentum we need to “break the back” of ALL government dog labs! That’s why a generous new supporter will match every contribution, dollar for dollar, up to $5,000 over the next 48 hours. White Coat Waste Project is a 501(c)(3) bipartisan coalition of 400,000+ liberty-lovers and animal-lovers opposed to the government’s wasteful spending on animal experiments. Our mission? 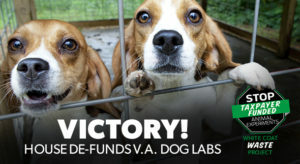 To stop $15 billion in taxpayer-funded animal experiments. National Review calls it a “refreshing consensus-building argument.” Our work has been profiled by The Washington Post, Science, US News & World Report, FOX News, LA Times, TheBlaze, Associated Press and Daily Caller. Contributions are tax-deductible. Previous Previous post: New Update On Skye! Absolutely Amazing! He is Eating On His Own! Next Next post: Tell Neutrogena to Stop Testing on Animals!